The relationship between a mother and daughter is special, but can become challenging during the teenage years - after all, the adolescent brain is undergoing many changes, according to WebMD. The teenage brain experiences an influx of testosterone and oestrogen hormones which rewire the emotional processing areas. Professor Steven Wood, of the University of Birmingham, specialises in adolescent brain development and mental health. He explains in an interview with WebMD that the teenage brain experiences an influx of testosterone and oestrogen hormones which rewire the emotional processing areas of a human brain. This chemical process in your teenage daughter's brain may make her more prone to arguments, sulking, sadness, anger or a desire to be distant from the family as she develops her social standing. "Teenage girls are trying to find out who they belong with, in terms of their peers, and how they're unique in that group. It consumes so much of their energy and focus, so a lot of the time they appear irritable when anyone intrudes on their thought processes," explains Dr Linda Blair, a clinical psychologist, in the same article. Understandably, this can prove to be a trying time for a mother-daughter relationship. Sometimes, seeking professional help from counselling can be hugely beneficial in smoothing over arguments that lead to particularly hurtful comments made on both sides. There are also other strategies for coping through this time to ensure a healthy, happy relationship lives on into adulthood for both women. Context and perspective can assist in solving even the harshest of disagreements. Dr Roni Cohen-Sandler, psychologist and co-author of a book specialising in mother-daughter conflict, notes the most common complaint she found during her research was that daughters feel unnecessarily and overly criticised by their mothers, who try to parent them in a demanding manner when they are aiming to be independent. On the other hand, the most repeated complaint from mothers was that their daughter's refuse to listen to their advice or instructions, and instead make poor choices and - interestingly - not spending enough time with them. These comments show there is underlying love on both sides. Mothers can plan to enjoy quality time with daughters but on their terms, granting the decision-making on the venue or activity to the daughter to show you value their independence. Once you appreciate the other person's standpoint, manage your expectations accordingly. Don't set lofty goals, but rather create realistic rules and expectations and communicate these regularly. Invite your daughter into providing explanation or reasoning for the rules, establishing which are non-negotiable but add areas where flexibility is an option. Treating her as a budding adult can prove to be more of an asset than a liability, demonstrating you respect her views, within reason. 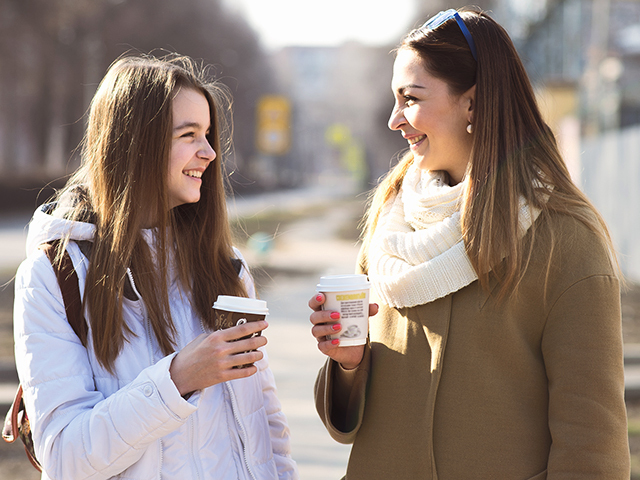 While some advisors say you don't need to be a "best friend" to your teenager, and this is true to an extent, the flip side is isolating her so much she feels afraid to disclose important information with you. At the very least, you two need to build a relationship of trust so that she can come to you. Often, the toughest aspect of this is keeping your temper in control and reacting to her news in a neutral manner if it is troublesome. Lead by example and showcase how an adult would respond to negative issues, helping her trust you genuinely "have her back". You can calmly explain why you disapprove of the behaviour later, once you first and foremost establish you're here to support her. Build a relationship of trust, with compromise on both sides. At Relationships Australia New South Wales, we provide a range of support services, from counselling to family therapy to help foster stronger relationships within families.